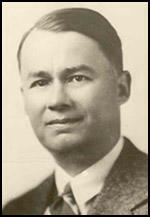 William Henry Chamberlin was born in Brooklyn on 17th February, 1897. He was brought up in Pennsylvania and studied at Haverford College where he developed socialist and pacifist views. He became a strong opponent of the First World War. As he explained in his autobiography, The Confessions of an Individualist (1940): "Temperamentally I was predestined to be out of step in a war atmosphere. For, although capable of a good deal of enthusiasm for a cause, an idea or a personality, I have always been unresponsive to the mass emotionalism that finds expression in wars, violent revolutions, and religious revivals. I am instinctively distrustful of any movement that calls for blind obedience and suspension of the reasoning faculty. Moreover, I felt keenly at the time and still feel that America's participation in the World War lacked the sanction of popular approval. I could see nothing of the spontaneous rush to arms that marked at least the first stages of the War of the Revolution and the Civil War, conflicts that arose over issues that were readily understandable to the masses. Before the draft was introduced, a week of voluntary recruiting was a pitiful failure, yielding only about one-tenth of the men who were called for." Chamberlin moved to Greenwich Village and became friends with the left-wing journalist, Heywood Broun. In 1922 Chamberlin found work as a foreign correspondent with the Christian Science Monitor and his first post was in Moscow. He later admitted that he was intially a supporter of the Bolsheviks: "I think 90 per cent of my Bolshevik sympathy grew out of my bitterly hostile attitude toward the war. I had only a vague general idea of socialist theory, and my first serious study of Marx and Lenin came after I was living in Russia. The socialism I more or less took for granted; what made me a staunch partisan of the Soviet regime throughout the whole period of the Russian civil war was the feeling that here was the culmination of a triumphant revolt against a plot of the ruling classes in general and the capitalists in particular against the masses of soldiers of all nationalities who had been killed, wounded, gassed, maimed. The transition from anti-war feeling to social radicalism was easy and natural because almost all organized opposition to the war emanated from labor and socialist sources. And in America it was generally true, with a fair number of individual exceptions, that the more well-to-do classes were the more ardent proponents of the war." However, Eugene Lyons, who worked for United Press International, found Chamberlin's reports "exact and scholarly and passionless". He added that all the foreign correspondents based in Moscow "seemed to me so exasperatingly calm and composed in the midst of high historical drama." He added: "My dispatches in these months were consistently and ardently partisan. It was a fight to the death between capitalist and socialist elements, in which those in the capitalist trenches deserved and received no quarter from my typewriter." Chamberlain was also impressed with Leon Trotsky: "Trotsky I saw at a collective interview which he granted to foreign journalists. He was in military uniform, the symbol of the post of Commissar for War which he would lose soon after Lenin's death. He conveyed the impression of possessing a mind more agile than Lenin's, quicker to throw out brilliant phrases, more fertile in original ideas; but, along with this, one felt the suggestion of a temperament more brittle and less stable. Here, one felt, was a man who might win a revolution by a stroke of improvised genius and lose it through a fit of misplaced temperament, of too obstinate adherence to a doctrinaire idea." According to Sally J. Taylor, the author of Stalin's Apologist: Walter Duranty (1990): "William Henry Chamberlin... interpreted these internecine struggles as the Bolshevik state's first few feeble steps toward a democratized form of government. Chamberlin came to the Soviet Union highly enamoured of the world's first Communist state, and he excused the excessive zeal of the Cheka on the grounds that it had been forced upon the Party by the Civil War." Chamberlin also wrote for the Manchester Guardian. Chamberlin published Soviet Russia: A Living Record and a History in 1930. He expressed views that were largely sympathetic to the communist experiment: "There are two points, I think, in which the Soviet system during the last few years has confounded its critics and given fair cause for jubilation to its upholders. These are quantity industrial production and the development of new capital from the internal resources of the country. In the first years of the New Economic Policy, when the state industries found it most difficult to turn out 25 or 35 per cent of the pre-war output, most foreign observers were convinced that Russia could not regain its pre-war level of industrial production without giving freer scope to the development of private capitalism within the country and attracting large-scale aid in the form of loans and concessions from abroad. But now the pre-war level has been left far behind; the percentage of industry, and especially of trade, in state and cooperative hands is greater than it was a few years ago; and the Soviet Union has received no loans and very little help in foreign investments. Industrial production for 1927-1928 was about 25 per cent higher than in 1913; production for 1928-1929, if the plan is carried out, will surpass the 1913 figure by 50 per cent." Chamberlin argued that the economic success of the Soviet Union meant that it would not return to capitalism. "Socialism in Russia, so far as may be judged now, has a tremendous theatre and an indefinite period in which to demonstrate its possibilities. I do not foresee the slightest likelihood of any drastic modification of the existing economic order, or anything in the nature of a return to private capitalism. The workers of Russia, with more than a decade of Soviet rule behind them, would never, I think, submit again to the discipline of a private employer." In the book Chamberlin praised the achievements of Lenin, describing him as "a master of the strategy of revolutionary attack when he organized and pressed on to a successful conclusion the Bolshevik seizure of power in November 1917". He added: "I doubt whether a man of corresponding will, energy, and mentality ever lived who was so averse to any theatrical exploitation of his personality, so willing to sink himself in his cause.... The international revolution which Lenin predicted so often and so confidently and which he believed would inevitably follow the triumph of Bolshevism in Russia has not yet broken out; and perhaps its prospects tend to grow dimmer rather than brighter with the passing of years. But as the leader of the Russian Revolution he ranks among the great statesmen of history." In Soviet Russia: A Living Record and a History Chamberlin discussed the way Joseph Stalin won the battle for power over Leon Trotsky, Gregory Zinoviev and Lev Kamenev: "That the practice of Party politics in times of controversy can be pretty sharp is undeniable. But the fact that Stalin prevailed over Trotsky, Zinoviev, and Kamenev in the struggle for Party leadership does not necessarily prove that his methods were less ethical than were theirs. It does tend to show that he was more skillful, logical, and successful in driving toward his goal.... All this external reserve does not, I think, cover an especially complex character. Strength of will and simplicity of world outlook are characteristic of Stalin, as they were of Lenin; and if one adds to these an extraordinary astuteness in manipulating the mechanism of the Communist Party organization, one has a fair measure of the main traits in the personality of the new uncrowned leader of the Communist Party. Stalin is an organizer and a man of action, rather than a theoretician; his published writings consist mostly of restatements of Leninist theories, sometimes accompanied by concrete illustrations of their practical application, and reprints of speeches and articles on current topics. For Stalin there is only one Marx, and Lenin is his prophet." On 31st March, 1933, The Evening Standard carried a report by Gareth Jones: "The main result of the Five Year Plan has been the tragic ruin of Russian agriculture. This ruin I saw in its grim reality. I tramped through a number of villages in the snow of March. I saw children with swollen bellies. I slept in peasants’ huts, sometimes nine of us in one room. I talked to every peasant I met, and the general conclusion I draw is that the present state of Russian agriculture is already catastrophic but that in a year’s time its condition will have worsened tenfold... The Five-Year Plan has built many fine factories. But it is bread that makes factory wheels go round, and the Five-Year Plan has destroyed the bread-supplier of Russia." Chamberlain, Eugene Lyons, Walter Duranty, Louis Fischer and the other journalists who were based in Moscow were not allowed to travel into the areas that Jones had described the famine that was taking place. Later historians have estimated that as many as seven million people died during this period. Journalists such as Chamberlain were willing to accept the word of the Soviet authorities for their information and they were later criticized for their reporting. Chamberlain was eventually allowed into Kuban that autumn. On 13th September, 1933, Chamberlain argued in the Christian Science Monitor: "The whole North Caucasus is now engaged in the task of getting in the richest harvest of years, and shows few outward signs of recent poor crops." However, Chamberlain told officials at the British Embassy that he estimated that two million had died in Kazakhstan, a half a million in the North Caucasus, and two million in the Ukraine. Chamberlin moved to Berlin in 1934. By this time he had developed a hostility to Joseph Stalin and his communist government in the Soviet Union. This was reflected in his book, The Russia Revolution: 1917-1921 (1935). The New York Times reviewer argued: "Mr. Chamberlin's intimate knowledge of Soviet conditions, the soundness and fairness of his judgment, his intellectual integrity and courage, his ability to present his findings to the general public in an attractive form without sacrificing any of the essentials, the straightforward simplicity and charm of his style have received the recognition they deserve.... This is no longer the work of Chamberlin the journalist, but of Chamberlin the historian. And in this new capacity Mr. Chamberlin succeeds in making a contribution of the highest order." 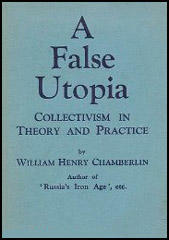 Other books by Chamberlin included Collectivism: A False Utopia (1937), an autobiography, The Confessions of an Individualist (1940), The World's Iron Age (1941), America: Partner in World Rule (1945) and The European Cockpit (1947). Chamberlin also lectured on world affairs at Haverford College, Yale University and Harvard University and wrote a regular column for The Wall Street Journal. 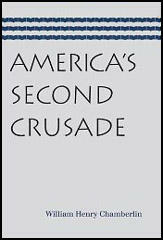 In 1950 Chamberlin published America's Second Crusade. Chamberlin opens the book with the words: "Americans, more than any other people, have been inclined to interpret their involvement in the two great wars of the twentieth century in terms of crusades for righteousness." According to Mark Weber: "Along with many other thoughtful Americans, Chamberlin was disgusted by the role played by the United States in the Second World War. He gave eloquent and scathing voice to his bitterness about the hypocrisy of western Allied leaders in that terrible conflict, above all, President Franklin Roosevelt, in a book that was his most important work in the postwar period... The past, as they say, is prologue, and an attentive reading of America's Second Crusade helps provide an understanding of the same arrogant and self-deluding thinking that is manifest in the eagerness of recent American presidents to use military might in foreign adventures, and, in the process, spend billions of the American people's money and take the lives of many young American men." William Henry Chamberlin, who lived in Cambridge, Massachusetts, died on 12th September, 1969. In this frame of mind I grasped at every straw of hope in Wilson's more liberal speeches, fell into discouragement whenever Lloyd George or Clemenceau called for a knockout blow and followed with interest the feeble and abortive efforts of the socialist and labor forces in various countries to pave the way for a negotiated peace. I began to believe strongly in Wilson's ideal of peace without victory after he had abandoned it. I liked to repeat a story which was told of Bob Smillie, a leader of the British miners. Smillie was reported to have said that, if asked the familiar hypothetical question, "Daddy, what did you do in the great War?" he would reply: "My boy, I tried to stop the bloody thing." Temperamentally I was predestined to be out of step in a war atmosphere. For, although capable of a good deal of enthusiasm for a cause, an idea or a personality, I have always been unresponsive to the mass emotionalism that finds expression in wars, violent revolutions, and religious "revivals." I am instinctively distrustful of any movement that calls for blind obedience and suspension of the reasoning faculty. Moreover, I felt keenly at the time and still feel that America's participation in the World War lacked the sanction of popular approval. I could see nothing of the spontaneous rush to arms that marked at least the first stages of the War of the Revolution and the Civil War, conflicts that arose over issues that were readily understandable to the masses. Before the draft was introduced, a week of voluntary recruiting was a pitiful failure, yielding only about one-tenth of the men who were called for. Once the huge machine of war propaganda and compulsion began to function, to be sure, it worked fairly smoothly. While there was, I am convinced, no popular will for war, except among a part of the well-to-do classes in the Eastern states (long after the Lusitania had been sunk Wilson was re-elected largely on the issue of "keeping us out of war") there was no conscious resolution to resist a war which the Government had somehow let the country in for. Goldberg sent me a short note in which he made the enthusiastic prophecy that socialism would soon sweep over the whole of Europe. He may be too optimistic. But it seems to me that, with Russia still in the hands of the Bolsheviki, with radicalism permeating most of the new states which have risen out of the wreckage of the Russian and Austrian empires, with Germany apparently gravitating towards extreme socialism, the frontier of capitalism has been suddenly pushed west of the Rhine. And indications are not wanting that the present governments of France, England and Italy will be compelled to face serious revolutionary movements on the part of the proletariat of those countries. I think 90 per cent of my Bolshevik sympathy grew out of my bitterly hostile attitude toward the war. I had only a vague general idea of socialist theory, and my first serious study of Marx and Lenin came after I was living in Russia. The socialism I more or less took for granted; what made me a staunch partisan of the Soviet regime throughout the whole period of the Russian civil war was the feeling that here was the culmination of a triumphant revolt against a plot of the ruling classes in general and the capitalists in particular against the masses of soldiers of all nationalities who had been killed, wounded, gassed, maimed. The transition from anti-war feeling to social radicalism was easy and natural because almost all organized opposition to the war emanated from labor and socialist sources. And in America it was generally true, with a fair number of individual exceptions, that the more well-to-do classes were the more ardent proponents of the war. The Russia which we found in the summer of 1922 was a curious mixture of fanatical communism and crude speculative capitalism, of bitterness and hope, of stagnation and revival. The country was just staggering to its feet after eight years of an ordeal such as few people have experienced. First there had been the World War with its prodigious casualties because of the inferior equipment and training of the Russian soldiers. This had been followed by the civil war, which took fewer lives on the battlefield, but more in terrorist massacres and devastating epidemics. And finally, during the year before our arrival, there had been the most terrible famine in Russia's history, caused by a combination of circumstances: drought, wars of food requisitions which had used up the peasants' reserves and destroyed their will to produce, breakdown of transportation. All this had torn up the old Russian social life by its roots. In the civil war brother had fought against brother, son against father. In the famine women had eaten their own children; people had killed and been killed for a sack of grain. So far as unlimited state power could achieve this objective, there had been a complete reversal of moral values. All the things that were held in highest official esteem before the war - the Tsar, the Orthodox Church, Russian nationalism - were now despised and derided. The mob was still being given its revolutionary circuses; just before we arrived in Moscow there had been trials of a group of leading Socialist Revolutionaries (members of one of the most important prewar revolutionary parties), and also of a number of ecclesiastics of the Orthodox Church. Marriage, formerly dissolved only with difficulty because of the canons of the Church, was now treated as a "petty bourgeois prejudice" and could be terminated without any formalities, at the will of either partner. Sexual promiscuity of men and women alike was encouraged by the shocks and dislocations of revolution, civil war, and famine. Perhaps the most striking symbol of the reversal of prewar values was the custom, at Communist Party congresses, of reckoning up the number of years which each member had spent in prison under the Tsar, the man with the longest recorded term receiving the greatest honor. Not all the tints in the picture of Russia in 1922 were dark. The country was visibly recovering from the rawest wounds of social upheaval and civil war. There was no more fighting, and the amazing resilience of the peasantry had produced a fairly good harvest in 1922 after the catastrophe of the preceding year. The New Economic Policy (generally referred to as NEP), with its substitution of a fixed tax in kind for the previous system of arbitrary requisitions, and its freedom of internal private trade, had revived the peasant's will to work. Indeed, food was more plentiful and of better quality during the first years of the NEP than it was when I left Russia almost twelve years later. While most middle-aged Russians were bitter, apathetic, or cynical in their attitude toward the Soviet regime, the younger generation was already feeling more at home in the new world which was growing up, even though it had not been so dogmatically drilled in communism as was the case later on. And there was a conscious effort on the part of the Communist party to mold the country along the new lines which I had theoretically approved in America. Strong in his armor of faith, convinced that Marx was an infallible prophet whose teaching must ultimately be realized, Lenin on the occasion when I heard him, as in many other speeches and writings, was willing to make the frankest admissions of failure and inadequacy as regards immediate details of his scheme. He spoke in German fairly fluently, although he occasionally borrowed an unfamiliar word from one of the delegates, and his style of delivery was rather dry and unemotional. It suggested a professor's lecture rather than a call to world revolution. This austere style was the natural reflection of a life which, before the giddy leap to power in 1917, had been largely spent in libraries and studies. The fierce, passionate power of the man, not so visible when I saw him in life, was brought home with irresistible force when I saw him dead, the face hardened in tense lines, one hand clenched as if in a last struggle to retain the reason which had departed before life itself left him. Trotsky I saw at a collective interview which he granted to foreign journalists. He was in military uniform, the symbol of the post of Commissar for War which he would lose soon after Lenin's death. He conveyed the impression of possessing a mind more agile than Lenin's, quicker to throw out brilliant phrases, more fertile in original ideas; but, along with this, one felt the suggestion of a temperament more brittle and less stable. Here, one felt, was a man who might win a revolution by a stroke of improvised genius and lose it through a fit of misplaced temperament, of too obstinate adherence to a doctrinaire idea. Stalin at this time was a legend rather than a flesh-and-blood being. "Lenin trusts Stalin; Stalin trusts no one," was a common saying. Those who were initiated in Communist party politics knew of the immense power which this olive-skinned son of a Georgian shoemaker was already wielding behind the scenes in his office as General Secretary of the Communist party. From this point of vantage he controlled the appointment and shifting of local Communist party functionaries, accumulated dossiers of material on every prominent individual Communist, "made" the elections to party congresses which would be packed with his henchmen. Few foreigners, either Communists or non-Communists, appreciated Stalin's significance at this time. With typically Asiatic suspiciousness he made it a point to shut himself off from all foreign contacts. Our first stay in Russia was broken by a period of a few months in Germany. This was the era of inflation, when the dollar was already buying thousands of German marks and would soon buy millions. Foreigners could live comfortably in Germany on almost nothing, and German bitterness over the lost war was correspondingly enhanced. I spent all the time in Berlin, except for trips to the Ruhr and the Rhineland, while Sonya took advantage of the opportunity to go to Paris and resume studies at the Sorbonne which had been interrupted by the outbreak of the World War. I enjoyed this German interlude very much. The solid comfort of Berlin, which had survived all the shocks of war, was refreshing after the chaotic inconveniences of Moscow. It suggested a warm bath after a hot and exhausting day. My early interest in German history and literature and music predisposed me to like Berlin. After America, where street names rarely suggest associations, it was inspiring to walk on Goethestrasse, Schillerstrasse, Kantstrasse, Rankestrasse, Steinplatz. I reveled in the operas of Wagner and in some of the works of Beethoven and Weber which I had never seen in America. The boyhood days when I had toiled over von Raumer and acquired some conception of the romantic side of the Middle Ages, the hours in the Philadelphia Public Library, the concerts at the Academy of Music gave me more than the average foreign visitor's feeling for the Cologne Cathedral and the castles on the Rhine, for Weimar, with its fragrant memories of Goethe and Liszt, and for the superb pile of the Wartburg. Men have dreamed of socialism ever since the coming of the modern industrial system. Philosophers and economists have worked out theoretical schemes of substituting public for private ownership of the means of production. Orators have stirred the masses with pictures of a new order which would ensure freedom and plenty for all. In all the industrially developed countries of Europe more or less powerful political parties have set socialism as the goal of their parliamentary efforts. But the roots of capitalism and private enterprise are deep and strong. Even the World War, probably the greatest shock which international economic life ever received, did not profoundly modify the essential features of the private capitalist system, except in Russia. There, in the technically back-ward former empire of the Tsars, where capitalism itself was a late and largely imported development, superimposed upon a semi-Asiatic feudal and patriarchal social order, there has grown up a new economic system, different from anything that exists elsewhere in the world, and shaped, so far as its organizers, can contrive, along the lines of revolutionary doctrine laid down by Karl Marx and Vladimir Ilyitch Lenin. The word "socialism" is so loosely used and abused that a little explanatory definition seems necessary. The decisive feature that appears to me to mark the Soviet economic system as genuinely socialist, in the Marxian sense of the term, in contradistinction to the economic systems which have prevailed, under the rule of professedly socialist governments, in Germany and Austria, in Sweden and Czecho-Slovakia, is the elimination of private profit as the dominant incentive in economic activity and the replacement of private by state operation of most of the country's industry and commerce. State ownership of railroads and municipal ownership of public utilities are quite common in Europe; and in most countries consumers' cooperatives attempt to compete more or less successfully with the private middlemen. But the main branches of commerce and industry are in the hands of private corporations or individuals. In the Soviet Union, on the other hand, private enterprise accounts for only about 2 per cent of the factory and mining production. Something over 90 per cent of this production comes from enterprises which are, in some form, owned and operated by the state; 6 or 7 per cent is from the factories of the consumers' cooperatives. Less than 10 per cent of the total trade turnover of the country passes through the hands of private dealers; and even in retail trade, where there was a revival of private activity in the first years of the New Economic Policy, the state and cooperative stores now handle more than three quarters of the total volume of trade. The state operates practically all the railroad and water transportation of the country, directs all the large banks, and monopolizes foreign trade. No private person may legitimately make a penny of profit out of this system of state and cooperative industry and trade, banking and transport. There are no individual shareholders in the state industrial enterprises; and the financial columns of the Russian newspapers are restricted to brief quotations of the rates of the state loans. All the normal means of acquiring large personal fortunes are thus pretty effectively blocked up in Russia; and if there are some Nepmen, or private traders who have become ruble millionaires through lucky dealings in commerce or speculation, they are certainly neither a numerous nor a conspicuous class. In surveying such a challenging experiment as the organization of the industrial and commercial life of a great nation along socialist lines the questions inevitably arise: How has it worked ? How does the socialist system of the Soviet Union compare in productive efficiency with pre-war Russian capitalism and with the post-war capitalism of other countries ? I have often wished that the responsibility for answering these interesting but very complicated and difficult questions might rest with some commission of super-experts in economics and industrial production, approaching the subject with no advance bias in favor of either capitalism or socialism and fully equipped with the encyclopedic knowledge which would be necessary for an authoritative consideration of the subject. In the absence of such a commission I shall venture to state a few quite humble and tentative impressions of my own on the working of Soviet economics up to date. There are two points, I think, in which the Soviet system during the last few years has confounded its critics and given fair cause for jubilation to its upholders. These are quantity industrial production and the development of new capital from the internal resources of the country. In the first years of the New Economic Policy, when the state industries found it most difficult to turn out 25 or 35 per cent of the pre-war output, most foreign observers were convinced that Russia could not regain its pre-war level of industrial production without giving freer scope to the development of private capitalism within the country and attracting large-scale aid in the form of loans and concessions from abroad. But now the pre-war level has been left far behind; the percentage of industry, and especially of trade, in state and cooperative hands is greater than it was a few years ago; and the Soviet Union has received no loans and very little help in foreign investments. Industrial production for 1927-1928 was about 25 per cent higher than in 1913; production for 1928-1929, if the plan is carried out, will surpass the 1913 figure by 50 per cent. A few comparative figures for individual industries show what a big upswing there has been since the inauguration of the New Economic Policy, when the Russian industries had sunk to a low-water mark of 15 or 20 per cent of the pre-war output. Socialism in Russia, so far as may be judged now, has a tremendous theatre and an indefinite period in which to demonstrate its possibilities. I do not foresee the slightest likelihood of any drastic modification of the existing economic order, or anything in the nature of a return to private capitalism. The workers of Russia, with more than a decade of Soviet rule behind them, would never, I think, submit again to the discipline of a private employer. If Lenin proved himself a master of the strategy of revolutionary attack when he organized and pressed on to a successful conclusion the Bolshevik seizure of power in November 1917, he proved his signal capacity for practical statesmanship when, by throwing the weight of his prestige and authority into the balance, he wrested a bare majority vote in the Party Central Committee for the signature of the ruthless Brest-Litovsk Peace, dictated by the German Government. Nothing is more difficult for a young and successful revolution than a retreat; and Brest-Litovsk was more than a retreat, it was a humiliating rout. Only Lenin's firm realistic grasp on the fact that no resistance was possible, that nothing could bring the crumbling Russian army back into the trenches, staved off the threatened German occupation of, Moscow and Petrograd, which might have spelled the end of the new Soviet state. This same capacity for realistic appraisal of a situation came to the rescue of Lenin and the Communist Party in the spring of 1921, when, despite military victories on all fronts, the Soviet Government was in the gravest danger of collapse from the almost impossible economic situation resulting from the collapse of industrial production and the steady decline of the planted area. Lenin perceived that the one measure which could give immediate relief was a stimulus to the productive instinct of the peasants through the substitution of a fixed tax and free trade for the former system of forced requisitioning of their produce. This was done; the sharp crisis which found expression in the mutiny of the sailors at Kronstadt and numerous peasant uprisings all over the country was overcome; the country was able to enter upon a new stage of development and economic reconstruction. Lenin's prescience had its limits and, broadly speaking, they were nationalist limits. More than once he grossly misjudged the political situation and revolutionary possibilities in other countries. He proclaimed again and again that the War must produce as its immediate aftermath other successful socialist revolutions. Strangely enough, he understood the Russian peasants, with whom he had comparatively little contact, better than the labor and socialist movements of the countries where he spent so many years of his life. He knew that the Russian peasant soldier would not fight against Brest-Litovsk in 1918; he knew that the peasantry would wreck the whole revolutionary experiment if they were not placated in 1921. But he never fully understood the difficulties which stand in the way of violent Marxist revolution in England and France, Germany and Italy. Lenin the man quite escapes and defies one's judgment because he is so completely submerged in the ideal of Leninism, or revolutionary Marxism. I doubt whether a man of corresponding will, energy, and mentality ever lived who was so averse to any theatrical exploitation of his personality, so willing to sink himself in his cause. To that cause, the cause of Communism, he gave his life in the fullest and most literal sense of the phrase. And by the success or failure of that cause the future will in large measure judge the significance of his life. Lenin combined the functions of leader of the Communist Party and head of the Soviet state. Although he was an extremely busy man, he was by no means inaccessible; many foreigners have talked with him; genuine interviews with him have been published in the foreign press. Stalin, on the other hand, is exclusively a Party functionary and holds no state office. He sees almost no foreigners, unless they are Communists or members of the left-wing labor delegations which sometimes visit Russia. Even the American business man with a disposition to discuss granting credits, for whom almost any door in Soviet officialdom will be unlocked, has no access to Stalin, who never talks to representatives of the foreign press, and speaks, as a rule, only at Party congresses and meetings, from which non-Communists are barred. All this external reserve does not, I think, cover an especially complex character. Strength of will and simplicity of world outlook are characteristic of Stalin, as they were of Lenin; and if one adds to these an extraordinary astuteness in manipulating the mechanism of the Communist Party organization, one has a fair measure of the main traits in the personality of the new uncrowned leader of the Communist Party. Stalin is an organizer and a man of action, rather than a theoretician; his published writings consist mostly of restatements of Leninist theories, sometimes accompanied by concrete illustrations of their practical application, and reprints of speeches and articles on current topics. For Stalin there is only one Marx, and Lenin is his prophet. Lenin himself was no mealy-mouthed controversialist and he more than once in pre-revolutionary days characterized Trotsky by epithets which were equally trenchant and uncomplimentary. All these things, on the surface, were forgotten during the period of revolution and civil war, when Trotzky joined the Bolshevik Party and held the highest offices in its service; but they constituted a veritable arsenal of material for the upholders of the Central Committee majority in their campaign to discredit Trotzky which began in 1924. Trotsky was irresistibly drawn into the revolutionary movement of 1917; his fiery rebel temperament could be satisfied only with the most extreme slogans and policies; and Lenin, whom he came sincerely to respect and who respected him, despite all the sharp early quarrels, was able to give free scope to Trotzky's vast fund of energy and organizing ability, and still maintain intact the unity and discipline of the Party. But it proved impossible for Trotsky to work in harness with Lenin's disciples after the latter had become incapacitated. And there were several things which barred Trotsky from succeeding Lenin as Party leader. There was the taint of heresy about him in the eyes of the older Bolsheviks, who could not forget that he had only joined the Party in 1917; there were the many enemies whom he had made through his vitriolic pen and through his ruthless administrative measures as Soviet War Lord; there was a widespread feeling that, while Trotsky was an invaluable leader in the active, destructive period of revolution, he was too mercurial and unstable to be a reliable guide in the slower and more prosaic work of economic reconstruction. Finally, the whole Party organization was in the hands of his enemies, which meant that every attack on him received maximum publicity, while in presenting his own case he was handicapped by the strict rules of Party discipline. Over long periods of time he could make no public speeches and the newspapers did not print his articles. When he defied Party discipline and began to circulate his articles through underground channels he could reach only a small number of Communists, and those mostly his own sympathizers; and by this he placed on himself the stigma of breach of Party discipline and illegal activity. Along with many other thoughtful Americans, Chamberlin was disgusted by the role played by the United States in the Second World War. He gave eloquent and scathing voice to his bitterness about the hypocrisy of western Allied leaders in that terrible conflict, above all, President Franklin Roosevelt, in a book that was his most important work in the postwar period. Entitled, America's Second Crusade, this 372-page historical study, which was originally published in 1950 by Henry Regnery Company, has held up very well as an outstanding work of revisionist scholarship. Harry Elmer Barnes praised it as "the ablest revisionist study of the background, course and results of the Second World War. It will long remain the best survey for the general reader." The past, as they say, is prologue, and an attentive reading of America's Second Crusade helps provide an understanding of the same arrogant and self-deluding thinking that is manifest in the eagerness of recent American presidents to use military might in foreign adventures, and, in the process, spend billions of the American people's money and take the lives of many young American men. We see this thinking in the recent and misguided attempts by American presidents to impose, by military force, currently fashionable notions of democracy and equality in such far-flung lands as Somalia, Bosnia and Haiti. If ever an understanding of history can tell us something about the future, it should be in such cases. To anyone with even a superficial awareness of 20th century history, the notion, for example - which President Clinton seems to hold -- that the United States military can somehow impose what we call "democracy" in a place like Haiti is obvious idiocy. He exposes the mendacity of American leaders such as Woodrow Wilson and Franklin Roosevelt, the fraud of the Nuremberg trials, and the hypocrisy and bad faith of the Allied leaders in their Second World War crusade.